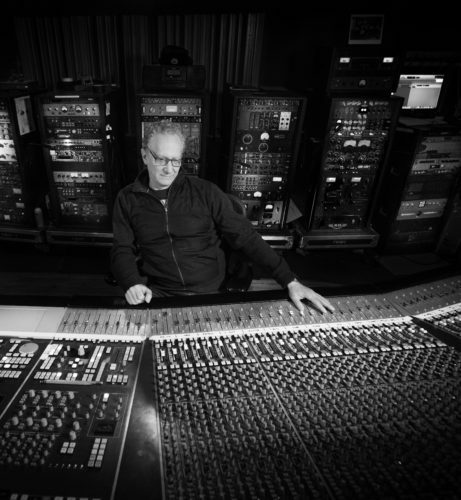 Michael Brauer is one of the most significant record mixers at work today. A man so successful at his craft, that to ‘Brauerize®’ a mix has become a verb describing Michael’s innovative mixing approach for bringing dynamic emotion to a song. With 7 Grammy awards under his belt so far for categories as diverse as best rock record, best pop record, Best Latin Urban, best world music and for Best Engineer, his discography reads like the Rock n Roll Hall of Fame. Michael’s reputation for mixing hits is as ingrained as his reputation for working on an eclectic range of artists. From the classic singer songwriters like Bob Dylan, Bruce Springsteen, Rod Stewart, Paul McCartney, Jeff Buckley, to the equivalent modern day guitar troubadours James Bay, George Ezra and Gavin James. From the biggest bands of yesteryear like Bon Jovi, and Manic Street Preachers to the current crop of stadium superstars such as Coldplay, John Mayer, and Florence and The Machine. His mixes for alternative bands such as The Kooks, Grizzly Bear, Marmozets, The Vaccines and My Morning Jacket have helped define their unique sound. He established his R&B pedigree working for some of the biggest names in soul, James Brown, Luther Vandross, Diana Ross, Aretha Franklin. Then to modern day electronic artists such as Phoenix, Aquilo, and Lo Moon and the pop styling of Elle King, Christina Perri and Tom O’Dell, Michael is the rare talent that can effortlessly move between genres, capturing the soul and performance of every artist. He’s built a reputation mixing freshman records that went on to be very successful by bringing out their unique sound. He’s also been able to balance that fine line of radio formats in a way that’s helped an artist cross over to the American market. Most notably are Coldplay and James Bay. Michael’s career began in the late Seventies at MediaSound Studios in NYC, working as an assistant for the most successful recording engineers of the time, Michael Delugg, Harvey Goldberg, Tony Bonjovi and Bob Clearmountain,. His first big break came when he was asked to mix two songs for the band Change featuring singer Luther Vandross, which lead to them working together on his platinum selling record ’Never Too Much’ and ‘Forever for always for love’. So began a long working relationship which saw Michael record all Luther’s material for the next four years including the ‘Jump to it’ and ‘Who’s zooming who’ Aretha Franklin albums, Teddy Pendergrass, Dionne Warwick, Cheryl Lynn and Dianna Ross. London came calling in 1984 and Michael hit the UK music scene at a time when it was at the forefront of cultural innovation, making records for the likes of Madness, Prefab Sprout, Paul Young, Roachford, When in Rome and becoming known as the go to guy for singles and 12” remixes including Fergal Sharkey/listen to your father, Total contrast/Takes a little time, TTD or If You Let Me Stay. Back in America, Michael’s reputation continued to go from strength to strength. Over the next two decades he won Grammys for Coldplay, John Mayer, Angelina Kidjo, Calle 13, and mixed Grammy winning records for Colbie Caillat, The Fray, Brazilian Girls, My Morning Jacket, Tony Bennett, Booker T & the M.G.s. He won an ARIA for the Birds of Tokyo album “The Saddest Thing I Know” and a JUNO for Coldplay’s “X&Y and TEC awards for John Mayer’s Continuum. He’s been involved in over 100 million records sold or streamed and has been awarded over twenty platinum discs in his career, and countless more gold record discs. If there is one word to sum up mix master Michael Brauer’s list of credits, it is eclectic. Brauer works hard to constantly expand into new musical territories and has a unique ability to stay as current and innovative and evolve at the same pace as the musical landscape. This is perfectly encapsulated in the last 12 months, which has seen him mixing The Marmozets critically acclaimed album “Knowing What You Know Now” as well a the track “Hold My Girl” on George Ezra’s number one hit album “Staying at Tamara’s”. Along side these Brauer has also being mixing records Anderson East and Big Boi, Callum Beattie, Vance Joy and Roger Daltrey. With an undiminished passion to continue to work with the best international musical talent and his personal goal to mix the greatest singers of our time, Michael’s list of accomplishments is sure to keep growing.